BUY THIS ANIMATION of a sine wave! BUY a steampunk version of this sine wave animation! SINE WAVES (y = sin x) are ubiquitous. They represent the behaviour of a simple oscillator. This animation illustrates the relationship between a circle (the wheel in this movie) and the phase (stage) of the sine wave. As the wheel rotates the attached horizontal pointer traces out a sine wave on the purplish screen. The maximum amplitude of the wave is the same as the radius of the circle (wheel in this case). The height of the wave at any point depends on the sine of the angle that the radius of the circle (yellow line) makes with a horizontal plane (not shown). The labelled diagram at left explains the relationship between the angle, the sine and the resulting sine wave. 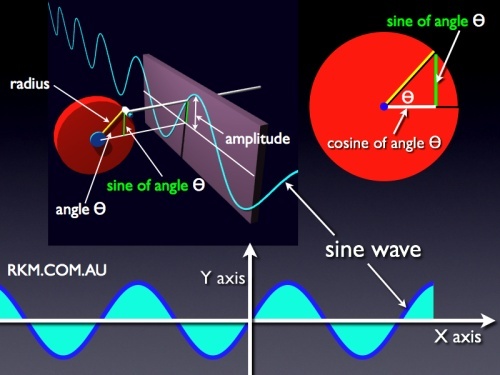 COSINE WAVES (y = cos x) are identical to sine waves but are shifted by 1/2 π with respect to the sine wave. In this animation the cosine wave (yellowish green undulation) is shown traced out on the lower greenish screen by the vertical pointer. The height (value) of the cosine wave at any point depends on the cosine of the yellow radial arm. At the beginning of the animation notice how the sine wave has a value of zero and the cosine wave a value of one (we assume the diameter of the wheel is one). The two arms projecting from the wheel are at right angles to each other (i.e. 90 o or 1/2 π) apart and this helps you to visualise the phase difference of 1/2 π between the sine and cosine curves. 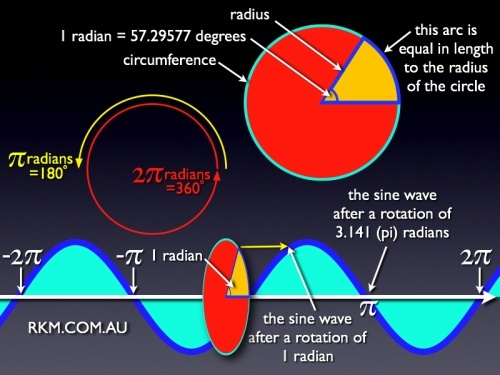 RADIANS: labelled graphic explaining the relationship between radians and degres and how they map onto a sine wave. RADIANS are a fundamental way of describing angles. We are used to angles like 90 o for a right angle but radians use the arc of a circle to describe a degree of rotation. The length of this arc is measured in terms of the radius of the circle. The circumference of a circle is equal to the radius multiplied by two (gives the diameter) multiplied by a constant called pi(π) which has a value of about 3.141. Consequently a complete circle contains 2π radians. This helps to explain why a graph of a sine wave is measured in fragments of π.